117. In their quest to achieve sustainable services for all, countries across the Danube region show very different levels of progress, with the level of progress generally mirroring the level of economic development of the country. In many ways, the sector is today in a better position than it was 15 years ago, but governments in the region will need to continue aligning policies, institutions, and financing mechanisms to ensure that service coverage, quality, and efficiency continue to improve while managing affordability constraints. Particular attention is needed to support the most vulnerable, the poor, minorities, and the rural population in obtaining access to affordable, quality services, as well. In this regard, the EU accession process represents a tremendous opportunity to influence the sector’s trajectory—but one that could easily be squandered if governments focus only on EU funds absorption and pure compliance, or push reforms without carefully looking at how the reforms address their specific challenges and the broader services sustainability agenda. 118. The report analyzes the capacity of countries to deliver sustainable water and wastewater services for all across four main dimensions: access to services (Chapter IV), quality of services (Chapter V), efficiency of services (Chapter V), and financing of services (Chapter VI). 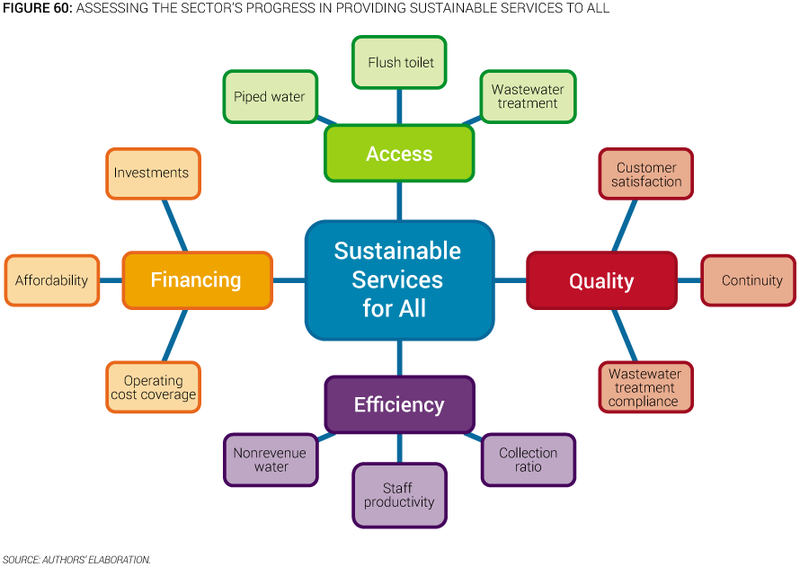 In this concluding chapter, those dimensions are consolidated into an overall services sustainability assessment with the aim of pointing to areas of particular challenge in each country. Each of the four dimensions is measured through three simple and objective indicators, drawing from the rest of this report (Figure 60). For each indicator, best practice values are established by looking at the best performers in the region. Countries closest to the best performers are deemed to have more sustainable water services. The region’s main challenges are also discussed, as are the opportunities presented by the current situation. The chapter also highlights areas of insufficient information and future work. 119. Given the limits of the data and analysis, policy makers and stakeholders should use these conclusions in a broader dialogue to critically examine what specific recommendations could be derived for their particular context. Although every effort has been made to validate the information presented, an exercise involving 16 countries and hundreds of sources of information is inherently challenging. There are information gaps, and only limited times series, and the quality of information is much better in some countries than in others. Some of the data sources might not be fully comparable. While the household-level analysis is representative at the country level, the utility data are not always comprehensive. National averages sometimes mask the significant heterogeneity within a country. Therefore, the report and its conclusions are meant to inform the policy dialogue in each country around priorities and areas of further work, rather than provide definitive recommendations. In parallel, this chapter also identifies a number of areas where more work is needed to understand the situation of the sector and put forward sound conclusions.